Social Contribution Activities - Social Responsibility - MICRONICS JAPAN CO.,LTD. In the case of sudden cardiac arrest, early intervention before handing the patient over to rescue personnel is acknowledged as a means of increasing the chances of resuscitation. 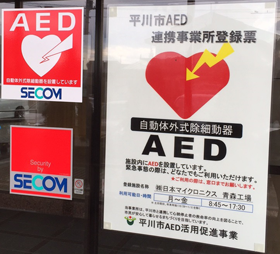 We envision that these AEDs could be used not only for MJC's employees but also for other people in the vicinity in an emergency. We are glad to contribute to the local community in this way. 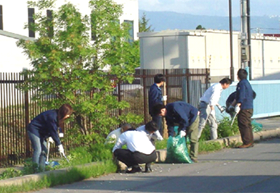 Since 2005, MJC's employees and other community members have been conducting volunteer cleanups, called Operation No Trash, at each of the Company's locations as part of its community contribution activities. We clean the roads, gutters, and shrubbery around our factories with a feeling of appreciation for the local communities that give us their loyal support. Aomori Factory participates in the Neputa Festival, a feature of summer in the city of Hirakawa, where the factory is located. We do our best to enliven the festival together with other members of the local community. 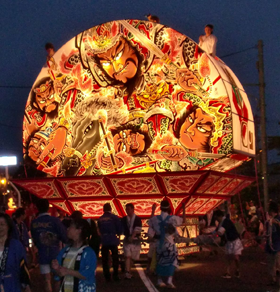 The photo of MJC's Neputa float shows an image of military rule subduing turbulent times through power, as described by the 3rd century Chinese warlord Cao Mengde. Cao Mengde was a brilliant strategist who ultimately defeated numerous rival chiefs who were proud of their rise at that time, including Yuan Shao, Lü Bu, Yuan Shu, and Liu Biao. He took possession of nearly all of northern China and was also a gifted politician who contributed to the strengthening of the country in terms of both the military and food production. As such, this float design depicts our hope for MJC's future growth. MJC holds a regular charity bazaar and donates the proceeds for community contribution activities and earthquake recovery assistance. We will continue to proactively carry out this kind of activity in the future. 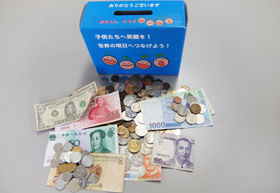 MJC has set up UNICEF foreign coin collection boxes at its locations in Japan, including the Headquarters and factories, to collect foreign currency that persons who have gone on overseas business trips still have when they come back. The collected coins go through UNICEF to support various efforts to save children in developing countries. Additionally, we collected donations from all employees as reconstruction assistance for the earthquake that struck Taiwan in February 2016 and donated it through UNICEF.